Don’t attempt Graduated Exposure until you thoroughly understand the concepts in this book – and don’t forget your flashcard..
Take time to create your Fear Hierarchies. Don’t be vague in your objectives. Know exactly what you want to achieve each day. Make it GRADUAL!! Consider any problems that might arise When planning your exposure consider any difficulties that might arise. For instance – what if you meet someone you know? what if there is a long queue at the check out? etc.. If the idea of exposure seems overwhelming, start by taking a friend or family member along. Once you gain confidence you can try it alone. Make sure the person knows EXACTLY what your objective is and that their role is to encourage you without pushing you too far. Repeat the exposure DAILY (or at LEAST 3 to 5 times a week) until your anxiety level is minimal. Too much time between exposure practice and you build up more anxiety. 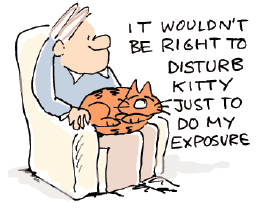 With regular exposure you are far more likely to get used to the situation – even bored with it! 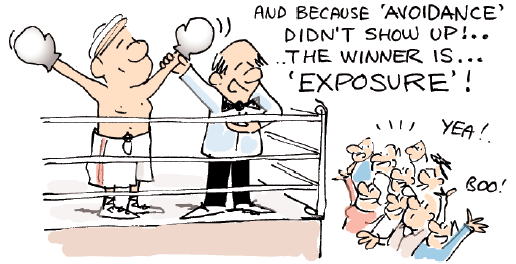 Exposure is NOT an endurance test! The whole point of exposure is that it TEACHES you about panic and the fact that your catastrophic predictions don’t actually happen. If somedays you just can’t do it don’t beat yourself up – try again as soon as you feel able. It doesn’t matter how long it takes. Do it as GRADUALLY as you want to – just as long as you DO it. will remain on hold until you put the work in. Avoidance CAN work in reducing a panic attack – but at what COST. Your life becomes limited and the fear remains intact. Exposure is initially a frightening prospect but the rewards are IMMENSE – you get your life back and you lose the fear altogether. Exposure is a clear winner by a long shot! Why Interoceptive Exposure practice SO important!